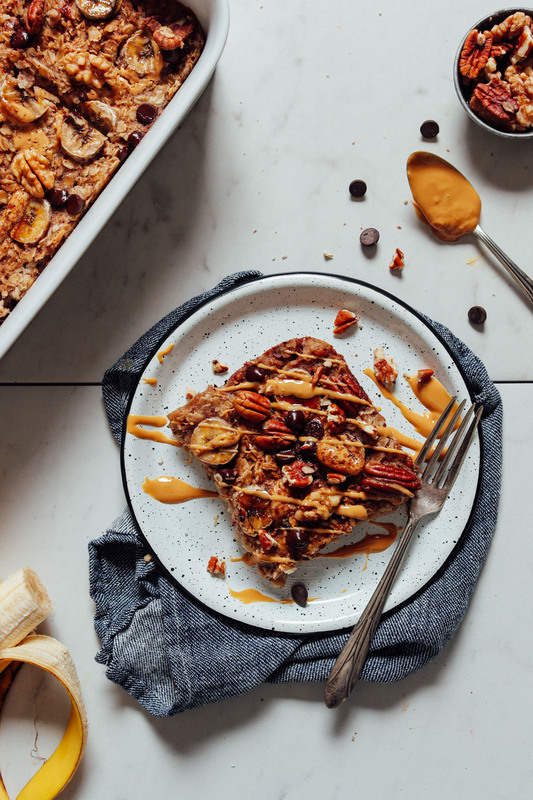 You all enjoyed my Pumpkin Baked Oatmeal so much I immediately knew I wanted to create another flavor variation, which happens to be my favorite combo of all time: Nut butter, banana, chocolate! It’s so easy and comes together in 1 bowl with 10 ingredients you likely have on hand right now. Let’s bake! 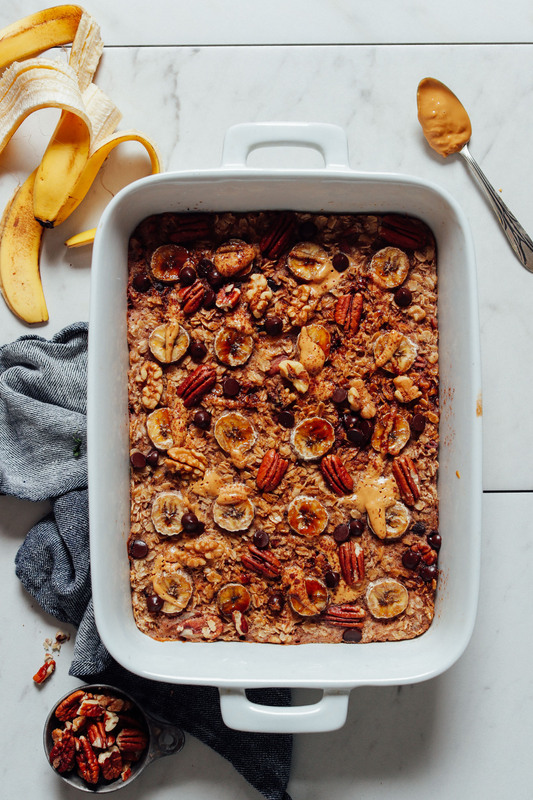 This baked oatmeal starts with a flax egg and mashed ripe banana. It’s then naturally sweetened with a little maple syrup, seasoned with cinnamon, and moistened with dairy-free milk and a little oil (which can be omitted or subbed with applesauce if needed). Next comes oats, nuts, and dark chocolate! We also recommend adding a little nut butter on top for garnish to give each serving even more richness. 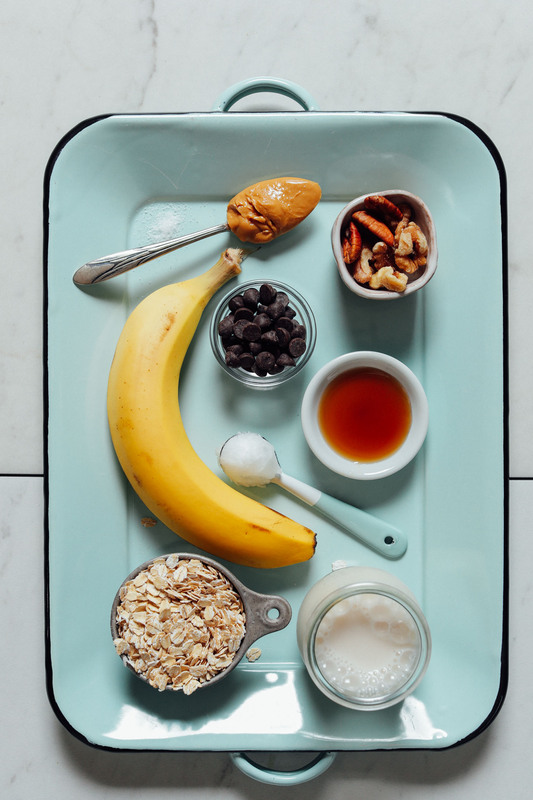 Plus, bananas and nut butter just belong together. After an optional sprinkle of coconut sugar for a brûlée effect, it’s into the oven for a 30 minute bake. And just like that, breakfast is on the table! This would make a delicious lazy weekend brunch to enjoy with friends or family. It would also be a satisfying breakfast to bake ahead of time and warm up in the mornings before work! I think it would travel especially well in a mason jar or glass container with a little dairy-free milk to be reheated at the office! Into oats? Also check out our Pumpkin Baked Oatmeal, Blueberry Muffin Breakfast Cookies, Vegan Gluten-Free Everything Breakfast Cookies, and Toasted Coconut Baked Oatmeal! 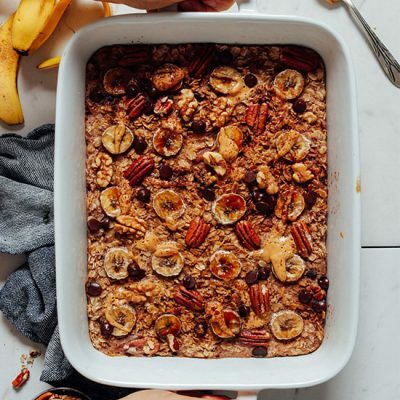 Hearty, banana-infused baked oatmeal that’s naturally sweetened, satisfying, and requires just 1 bowl and 10 ingredients to prepare. The perfect cozy, comforting breakfast. Preheat oven to 350 degrees F (176 C) and grease a 2-quart (or similar size) baking dish with oil (or vegan butter), or line with parchment paper. Prepare flax eggs in a large mixing bowl. Then add ripe banana, maple syrup, oil, salt, and cinnamon and whisk to combine. Add dairy-free milk and whisk once more. Then add oats, nuts, and half of the chocolate chips and stir to combine. Transfer mixture to the prepared baking dish and top with additional banana slices, nuts (optional), and remaining chocolate chips. 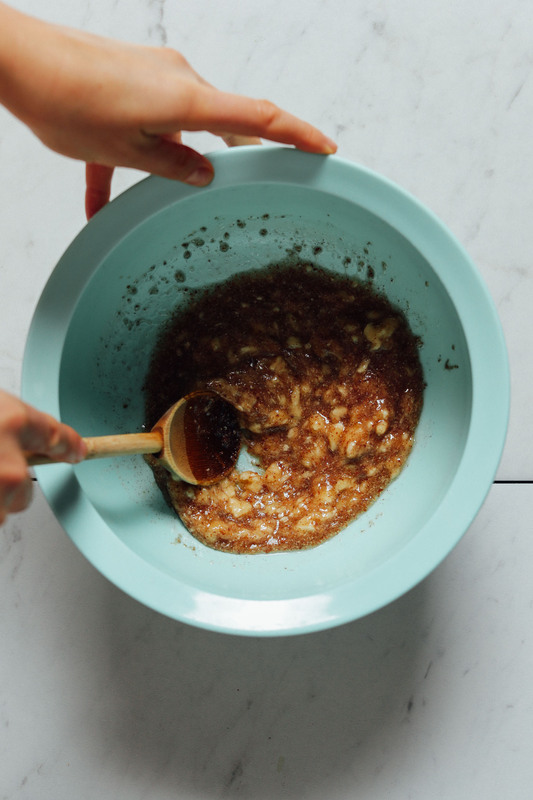 Sprinkle with coconut sugar for a “swirl” effect (optional). You can also drizzle with a little nut butter — such as almond or peanut — for even more flavor (optional). Serve warm with desired toppings, such as warmed coconut milk or almond milk and a drizzle of maple syrup or additional nut butter. Store leftovers covered in the refrigerator 3-4 days (or in the freezer up to 1 month), though best when fresh. Reheat in a 350-degree F (176 C) oven or in the microwave until hot, adding more dairy-free milk as needed to moisten. *If subbing eggs for flax eggs, 1 flax egg generally = about 1 small chicken egg. * Nutrition information is a rough estimate calculated with coconut oil, half unsweetened almond milk and half light coconut milk, and walnuts, without optional ingredients. I made this for breakfast when we had houseguests over. It was super easy and was delicious. We topped with melted cookie butter to splurge a little bit. This looks to die for! 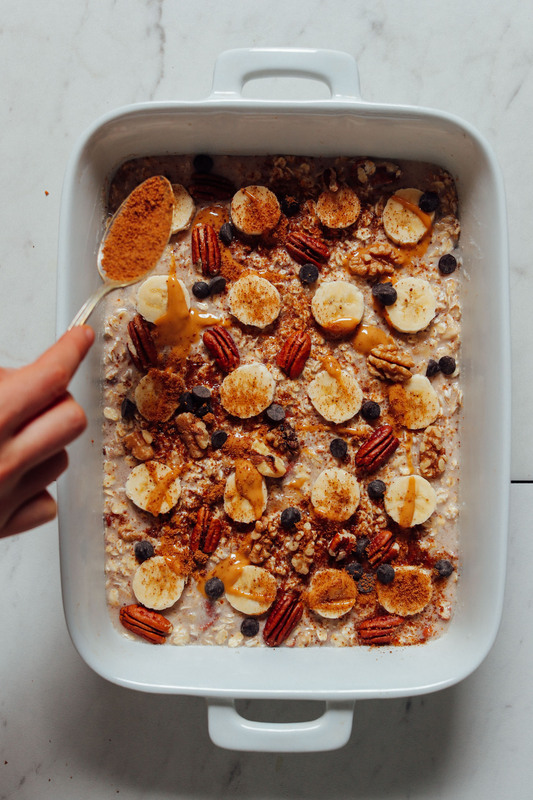 I LOVE baked oatmeal and I would totally love to create some myself <3 Banana bread is, additionally, one of the BEST flavors for oatmeal and any porridge recipe! I just made this last night and it was a HIT with my boyfriend and I. I then decided to bring some for my friends at work…and needless to say I might be getting a raise! Its incredibly delicious and comforting and just SO GOOD! Also- I had the container sitting out on the counter as I was warming some up and a co-worker was like “OMG is that Minimalist Bakers recipe? !” You have many fans in our office! I’m thinking of bringing it to my boyfriends parents house on Saturday for Sunday brunch. Do you think I could make it Saturday and keep it in the fridge to bake off Sunday morning? Let me know! Hi Elise, so glad to hear this- thanks for sharing! Yes, it can definitely be prepped the night before and baked in the morning! I made this with avocado oil, cow’s milk, no nut butter, and extra chocolate chips (half a cup or so) and it’s so good (even when cold)! Could I make this with quick cooking steel cut oats instead of rolled oats? Hi Debbie, we haven’t tried that, but it might work! You may want to use more liquid or try a smaller batch to test it out. Hope that helps! If you give it a try, we would love to hear how it goes! I was out of cinnamon so I used nutmeg and it almost did the trick but not quite. I also sliced my bananas pretty thin and they were fairly dry when they came out of the oven so I suggest thicker slices for the topping. This wasn’t really my cup of tea but I can see why folks who really like oatmeal would dig this recipe. Still <3 all things Minimalist Baker! I love this recipe! Easy to make and absolutely delicious 😊 I make it with the flax egg. This was excellent – made it for my entire (non-vegan) family for breakfast after a sleepover get together. They all loved it and had more than 1 serving! Followed the recipe exactly… maybe adding a few more chocolate chips. Yum! A quick and easy recipe for the work week! This was super yummy, my kids & husband ( who usually doesn’t like oatmeal) loved this! I made modifications, but used the recipe as a base. I used honey instead of syrup, powdered milk, omitted the chocolate chips, added grated apple and bit of shredded coconut, topped with banana & pecans. Baked for about 30 minutes, realized I forgot to drizzle with peanut butter, added it, then baked another 5-10 minutes. We served it with yogurt, shredded coconut and cinnamon! Next time I will also add frozen blueberries! Lovely! Thanks for sharing, Heidi! I made this yesterday and it’s fantastic! I skipped the coconut sugar and nuts but otherwise followed the recipe. I used Oatly and gluten-free quick oats as well. Topping with banana slices is absolutely a must! I will definitely be making this again. Great! Thanks for sharing, Heather! I used 3x the mashed banana the recipe calls for (1.5 cups), halved the non-dairy milk (1 cup), omitted the oil, and used quick oats instead of rolled. It came out perfectly! Thanks for a quick, delicious, healthy breakfast that I can go to every morning this week! New way to get my oats in, made it exactly, except I put all walnuts. I did not add the coconut sugar, but I will next time. Sent some to work for my hubby’s breakfast. Winner! So delish, thanks for sharing. Lovely! Thanks for sharing, Colleen! I live alone so I modifies the recipe a bit so I would have just a single serving. I microwaved the oats, flax and banana then stirred everything else in. Yum! I might have added a few too many chocolate chips but what the heck? It’s Sunday breakfast. I would love to make this an many of your other recipes, but I have a nut intolerance. Many of your recipes require nuts or nut butters. Can you omit tremor do you have ideas for substitutions? Can you omit the nuts or do you have ideas for substitutions? You could skip the nuts, and the nut butter, chopped apples would be awesome in this dish, and I think raisins too. Actually going to try this as well. Lovely suggestions, Colleen! Any seasonal fruit or your favorite seed/seed butter would do! This is so stinking good! I didn’t do any extras – just the main mix of oats, bananas, maple, chocolate chips, etc. (but I used chicken eggs) – super tasty and doesn’t need anything beyond a splash of non-diary milk. I’ve been heating it up all week at work and it’s such a delicious treat for breakfast, and under 400 calories per serving! Lovely! thanks for sharing, Jana! You’ve done it again! You created another recipe that’s filled my belly with happiness! I made this today and the only change I made was that I omitted the chocolate. I’m always telling my daughter chocolate isn’t for breakfast so I have to abide by those rules too ;) It’s absolutely delicious and it feels pretty decadent because it’s like eating banana bread for breakfast. I can hardly wait until tomorrow morning for more! The recipe is so easy and so delicious that it will be added to my regular roster of breakfast plans, like so many of your recipes. Thank you! So so kind! Thanks, Caroline! I made this last night as my breakfast meal prep for a few days. Instead of using oil or apple sauce in the recipe, i just added extra mashed banana and used only almond milk. I forgot to add sliced banana as the oatmeal topping, but it still came out delicious and I’m adding fresh banana on the side. 30 seconds in the microwave this morning warmed it up to perfection and it was great alongside my coffee. Thank you for this easy recipe; as someone with Hashimoto’s, sometimes I don’t have the energy to spend a lot of time in the kitchen prepping to cook and washing all the pans afterward. I dirtied one bowl for prep, one fork for mashing/stirring, and one pan for baking (which I’m leaving the oatmeal in as I consume) so this was a perfect recipe for me. I think next I’ll try this same base but half/half light coconut cream with almond milk, blueberries, and lemon zest for a different variation. Lovely! Thanks for sharing, Evelyn! We all loved this including my toddler. I was looking for easy, but good, make ahead breakfasts and this was perfect. I used real eggs, left out the chopped nuts because the toddler isn’t ready for them and instead included melted nut butter in the mixture itself. Made it the night before and it came out great although I had to bake it longer since it was cold to start. Thanks so much. Can’t wait to try the pumpkin one. Yay! Thanks for sharing, Helen! This beautiful and yummy dish as my home smelling a wonderful bakery. The smelled stirred up childhood memories when my mom use to bake on Saturday mornings. What a wonderful treat! So delicious! I am going to make this often! Thanks for sharing, Shene! Next time would you mind adding a rating to your review! It’s super helpful to us and other readers. xo! I am not an oats fan, but this recipe quickly changed that! I used Muesli instead of oats only, since I already had it in my pantry. We ate it right out of the oven as dessert with some crunchy almond butter and 2% milk, and absolutely loved it. It’s the perfect amount of sweet. We plan to have this for breakfast for rest of the week. Thanks for this amazing recipe. Will definitely remake it. What!! This looks incredible, Dana. My type of breakfast! So delicious! I didn’t have flax seeds so I subbed for chia eggs and it came out great (I didn’t have regular eggs at home either). I used coconut milk, cashews, and dark chocolate chips for my recipe. I ended up using rolled oats, because that is what I had on hand. I didn’t have an issue with baking, since I let the mixture sit overnight. The oats softened enough to cook perfectly in the oven for 30 minutes. I topped the oatmeal with chocolate chips, cashews, cinnamon, almond butter, and sugar. I’m eating a serving right now and it is delicious. I love that I have a few portions that I can vary a little each day, but keep the same delicious base! Wow, you put this all in one bowl? I’m amazed! Usually I would have eaten my oatmeal and its toppings in multiple, smaller separate bowls. I find this really helps with my mindful awareness for the day and also to loosen my IBS. But putting many things in just one bowl is just amazing. I can’t wait to try it! Yep! It all mixes together in 1 bowl! Hope you enjoy it, Helen. This just came out of the oven at 7pm in Singapore. I’ve had a taste and wow, it’s delicious! I subbed honey for maple syrup as I’d run out. For the nuts I used a mixture of walnuts and almonds. And for chocolate I roughly chopped 90% dark chocolate (I like my chocolate really dark). The coconut sugar was a really nice touch! 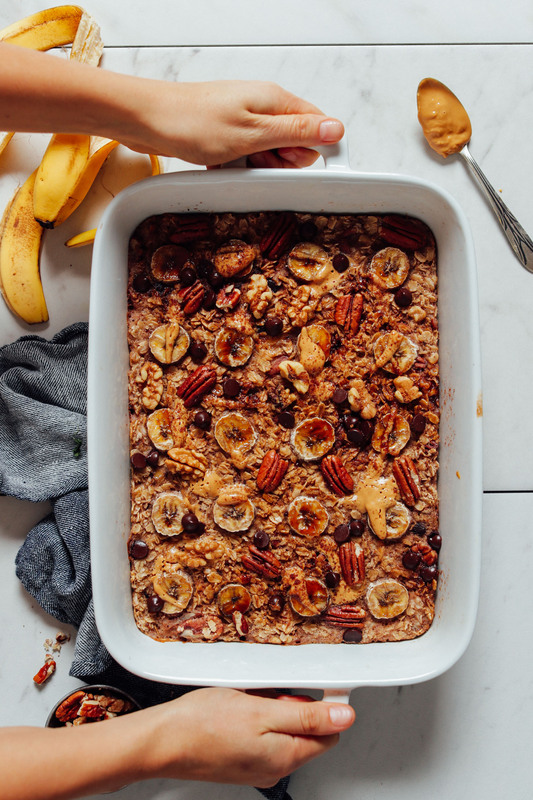 I love that this baked oatmeal isn’t too sweet – exactly how I like my food. Thank you for a great recipe! Could quick cooking oats be used for this?? It looks delicious, but I live in South America and quick oats are the only I can easily find. That should work! Just bake a little less time I’d presume? Let us know how it goes! Just made this and had it for breakfast. Very easy and very yummy! I used the applesauce instead of the oil, spooned some peanut butter and sprinkled 1 TB coconut sugar on the top before baking. Plenty sweet. Ate it with some warmed up non dairy milk. Highly recommend!!! Yum! Family can’t stop staying wow that was good! Thank you MB! I am allergic to Oats of any kind. What would be a good substitute for Oats? Hmm, not sure there. Perhaps a blend of ground nuts, seeds, and coconut? 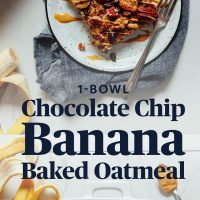 I’ve never been a fan of oatmeal, yet was intrigued by baked oatmeal as I love to bake. This was delicious and so filling! wow! I love the banana chocolate combo and I added pb onto it after it baked. I subbed applesauce for the oil as I had some to use up. A great lazy Sunday morning breakfast to make and now I have lots for the rest of the week too. Another fantastic recipe! Thanks! Yum! Another winner. Baked mine for 40 minutes because I like my oatmeal on the drier side. So looking forward to eating this all week – thank you! Great! Thanks for sharing, Nora!! Delicious Sunday breakfast with leftovers for the week. It was easy to make and even though I am not Vegan and made with regular eggs, it came out great. Definitely a keeper! Thanks Dana. This looks great! Would love to try, but I’m allergic to flax, any advice for substitutions? Thanks! I’ve successfully substituted ground chia seeds for the flax seeds in other recipes. Might be worth a try!! Thanks, Anneline! Yes, flax would work. You could also try hemp seeds! 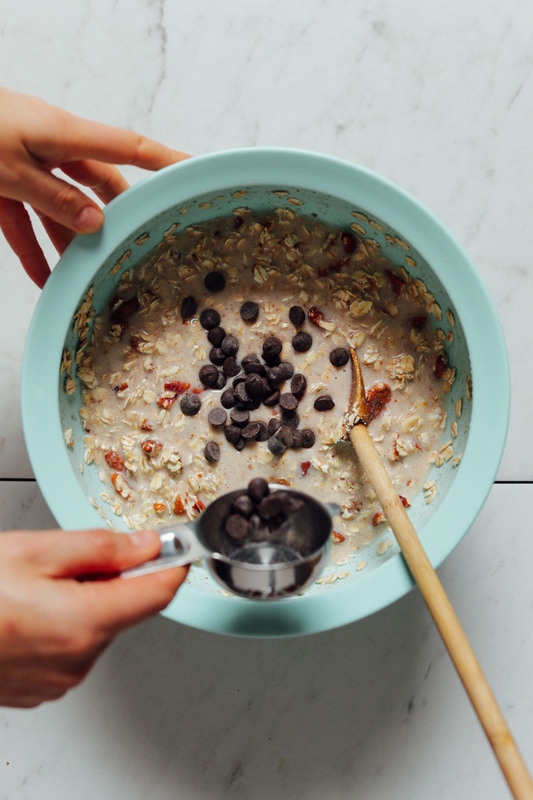 I’m anxious to try this – can I use steel cut oats in place of rolled oats? Susan, you can try that but I suspect you’ll need to increase the liquid : oats ratio (more liquid), try covering it while it bakes, and bake longer as steel cut oats require more time to cook through. Let us know if you give it a try! If substituting regular oats for the gluten free, would the measurement be the same? I prepped her pumpkin baked oatmeal overnight and it turned out perfect. I’ve also experimented and have done a cinnamon/apple/walnut version. So good. The morning I bake it I just add a splash of almond milk to the top. Thanks for sharing, Lara! Yes, it can definitely be prepped the night before and baked in the morning! Would I be able to assemble this the night before and bake it in the morning? I think so! Let us know if you give that a try! Did you end up trying this? I would think maaaaybe it might need a bit more liquid as it would all be soaked up by morning and that would be the point of the baking?